The first row of an afghan with homespun or bouclé or other knobby style yarn can be frustrating. This afghan does not require finding chain stitches, even for the first row. The lacy diamond pattern keeps the afghan light even with a heavier yarn. The example is made in Jo-Ann Sensations Rainbow Boucle (now made by Purl Essence). Row 1: Ch 3, tr in first ch, (ch 3, tr in last ch sp) until you have made desired number of tr/ch spaces. Make an odd number of tr/ch spaces. Row 2: Ch 4. Without turning the work, make 2 dc in first space (over tr just made). Working across the spaces (holding it so that the tr stitches are on top, so work will be made over the tr stitches), skip one space and make a Shell in the next space across to the last two spaces. In the last space make 2 dc, ch 1, 1 dc. Row 3: Ch 4 and turn. 1 dc in ch-1 sp, ch 2, sc in space before next Shell (between dc of partial Shell and first full Shell) ** ch 2, V-stitch in ch-2 space of Shell, ch 2, sc in space between Shells. Repeat from ** across to end with the last sc made between the last full shell and the partial shell at the end of the row. Ch 2, V-stitch in ch-4 space. Row 4: Ch 4 and turn. 2 dc in ch-1 sp, ** skip ch-2, skip sc, skip ch-2, Shell in the next V-stitch. Repeat from ** across to ch-4 turning chain. Skip ch-2, skip sc, skip ch-2, (2 dc, ch 1, 1 dc) in ch-4 sp. Repeat rows 3 and 4 until afghan is desired length. If no additional border is desired, finish off and weave in end. Optional border – end with a row 3. Border round 1: Ch 3 and turn. (1 dc, ch 2, 2 dc) in ch-1 sp, ** skip ch-2, skip sc, skip ch-2, Shell in the next V-stitch. Repeat from ** across the top of the throw to the ch-4 turning chain. Work the following in the ch-4 turning chain sp: shell, ch 2, shell. Mark the 2-ch between the shells as the corner. On the side of the throw, make a shell in each space formed by the ch-4 turning chain of the rows. At the bottom corner, in the ch-3/tr space at the corner work (shell, ch 2, shell). Mark the 2-ch between the shells as the corner. Working across the ch-3 spaces at the bottom of the blanket, (skip one space and make a Shell in the next space) across to the last two spaces. In the last space work (shell, ch 2, shell). Mark the 2-ch between the shells as the corner. On the side of the throw, make a shell in each space formed by the final dc of the rows. Ch 2, slip stitch to join in the third chain of the first shell of the round. Mark the 2-ch between the shells as the corner. Do not turn. Border round 2: Slip stitch in the next dc, slip stitch in the ch-2 space, ch 4, dc in same ch-2 space [** ch 2, sc in space before next Shell, ch 2, V-stitch in ch-2 space of Shell. Repeat from ** across to the corner, ch 2, (sc, ch 2, V-stitch, ch 2, sc) in the corner ch-2 space, move the corner marker to this last V-stitch, ch 2, V-stitch in the ch-2 space of the shell] four times, but on the last repeat, exclude the last V-stitch, join with a slip stitch in the third chain. Do not turn. Border round 3: Slip stitch in the ch sp. Ch 3, (1 dc, ch 1, 2 dc) in same sp. Make a shell in the ch-1 space of each V-stitch around, except at each corner, make (shell, ch 2, shell) in the ch-1 space of the corner V-stitch. Move the corner marker to the ch-2. Join in the third chain of the first shell of the round. Do not turn. Rounds 2 and 3 can be repeated to desired width. Finish off and weave in end. Love the no chain throws, I also loved your chemo hats, would you by any chance have them in crochet patterns as I can’t seem to get the hang of knitting. Thank you! To date I’ve only done knitted hats. If you do a little searching, there are quite a few crochet hat patterns online for free. I have just started the no chain throw. I LOVE IT!!! It is so easy and so fun that I hate to put it aside to do anything else. Thank you! This is beautiful! I love the idea of not having a beginning chain. Can’t wait to make this. Thanks! My border doesn’t look like the picture. Should it?? Crazy!!! If you can, send me a picture and maybe I can figure out what is going on. Send to mama at thetucker dot com. They are for patients confined to a wheelchair. 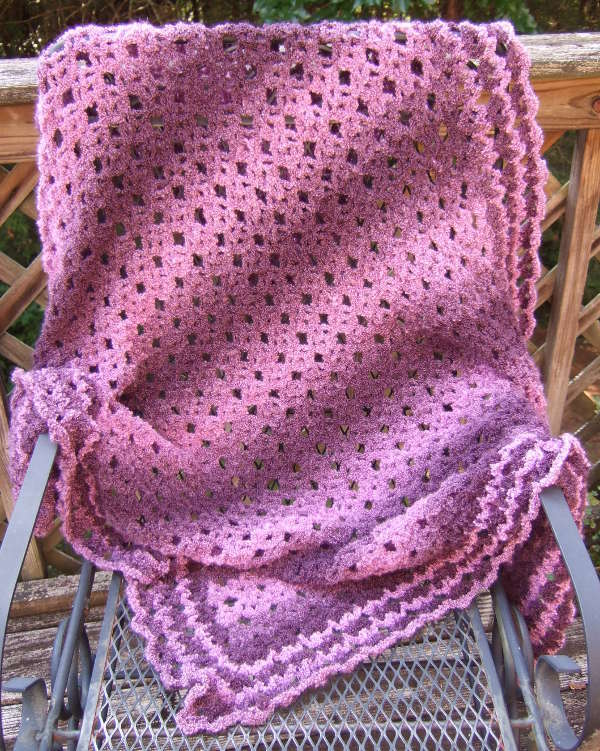 Almost every throw/afghan/blanket on my site was made as a lapghan for hospice patients. Were you given a recommended size? My charity wants them to be at least 30 inches square. Almost any pattern can be made in a lapghan size. Almost all of mine have different beginning chain amounts for different sizes. Make sure that you don’t go too big for wheel chair patients due to the “gan” getting into tires on wheels but make it more oblong! This is something I have not tried. I am looking forward to starting something. will try it, i have converted many afghan patterns to crib/baby size, or, if pattern allows, table toppers/cloths. Pretty pattern. I’ll probably make it when I get caught up with my current afghan. A tr is a triple crochet. A tr ch space is the space formed by making 3 ch and then a tr into the prior ch space. I have to admit I was intrigued by the concept of no chaining so I checked on your site. Life changing idea for people who crochet. Thanks so much for sharing! I also like the idea of not having to start with a long chain. I will try it during the summer months, while on vacation. Do you have a video on this one?? This is the 2nd Afghan of yours so far that I just had to make. Your videos are so very informative amd helpful when I get stuck. My 1st afghan of yours came out great. I don’t yet but will add it to my list. This summer I plan on trying to get caught up on making videos. I love this pattern! Just a couple of quick questions. Does the total yardage of yarn required include enough for the border or is that extra? How much of the alternate color of yarn is needed (I am planning on making a large size afghan)to make an afghan like the one that you made with the same color changes? The yardage I give is only for the body of the blanket, but so are the measurements, so adding a border will make it bigger. If you reduce the width to accommodate the border, the yardage will be closer to the full width amounts. This was a variegated yarn that I used. I’ve just started…and have a question on row 4. It seems really tight. If I lay it out flat, it looks like the first 3 rows are ruffled due to the tightness of row 4…the only stitches we do in row 4 are the v stitches – and no chains in between? Row 4 is actually shells which are made into the previous row v-stitches. There are no chains between. I agree, something funky happens on row 4. It seems too short, the edges don’t line up evenly. I will keep going and see if it works itself out. luckily I am only doing a sampler square for practice. A video for this would be EXTREMELY helpful. Hoping to find it. Hi there. Where you able to make the video this summer, as planned?? I hope so. If yes how do I find it? I’m sorry I wasn’t able to, but it is still on my list to do. Once I work out a better setup for these videos I’m hoping to get them all done fairly quickly. I have a question about row 2. In the first space I have 2 dc and then are the rest across just *(skip chain space, shell)* across to the last 2, then skip one and 2dc, ch1, 1dc in the last space. Is this correct? That’s correct. You make a shell every other space. There are no additional stitches between the shells. Thank you so much for these beautiful no beginning chain throws. I am currently working on some lapghans for cancer patients that my temple is donating the supplies for us. It is nice to find patterns that use most any yarn and they work up so nicely and quickly. I also sell some of my own afghans at a boutique run by my temple’s sisterhood and I know that some of these patterns will be used. I’m sorry it took me so long to do this, but the photos are posted now. This pattern looks great. Chaining is my least favorite part of any project (aside from weaving in ends) so I’m excited to try this pattern. Thanks so much for sharing! Thank you, thank you, thank you!!!! I love these no chain starts. I am new to crocheting and could never get my chain rows to look even and/or I did not count correctly. This is SO SO SO much easier. Your instructions are clear and the pictures really help. Happy crocheter now. How many regular DC are supposed to go into a single loop? For your pattern, the pictures show you put 4 stitches into a loop, with a chain in the middle. I will be putting 2 DC (and a chain) into each loop. Should I make the loops a different size to accommodate my pattern? Thanks for your advice! The shells that are made in that first row following the foundation loops are 2dc, ch2, 2dc shells. You should skip a loop between shells.